The perfect gift from Hawaii for that chocolate and coffee lover. This lauhala basket is filled with one 16 oz. box chocolate macadamias Classic Tiki, two 4.5 oz. cans Dry Roasted Salted Macadamias, three 1.75 oz. Kona Coffee flavors, and one Hawaiian designed mug. 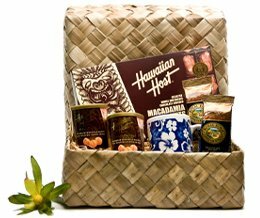 Everything is packaged in a handmade lauhala gift basket. The ribbon may vary. The basket is decorated with either a beautiful hair pick or tropical luggage tag. Basket measures: 10 by 10 by 4 inch. The seller will randomly select the basket design. Gourmet Hawaiian chocolates & Coffee will add a special touch to your next party! If you have any questions about this product by Hawaiian Host, contact us by completing and submitting the form below. If you are looking for a specif part number, please include it with your message.